The Volvo XC90 luxury SUV first launched in 2002 and has undergone a simple evolutionary development process ever since – up until now. 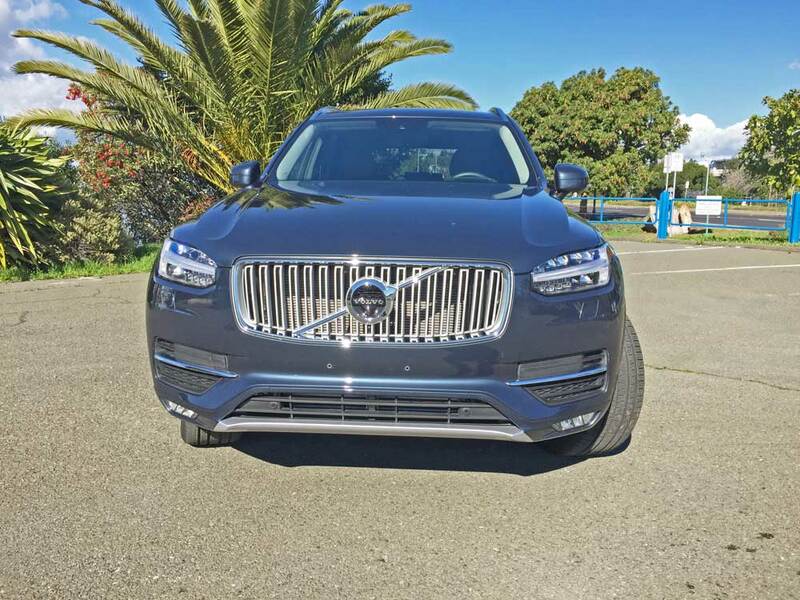 Enter the 2019 Volvo XC90 T6 AWD with its three trim models, all of which are powered by a 2.0-liter, DOHC, 16-valve Supercharged and Turbocharged in-line four-cylinder engine with an integrated (SFI) ignition control system that makes 316 horsepower at 5,700 rpm while developing 295 pound feet of torque in a range from 2,200 to 4,500 rpm. The transversely mounted front engine mates to an eight-speed Geartronic automatic transmission that meters motive energy to all four wheels. Turbocharging is constant, with supercharging automatically activated as needed. External dimensions as well as mechanicals are shared by all trim levels: The Momentum trim is expected to be the volume sales leader, followed by the T6 AWD R-Design and then the Inscription model. 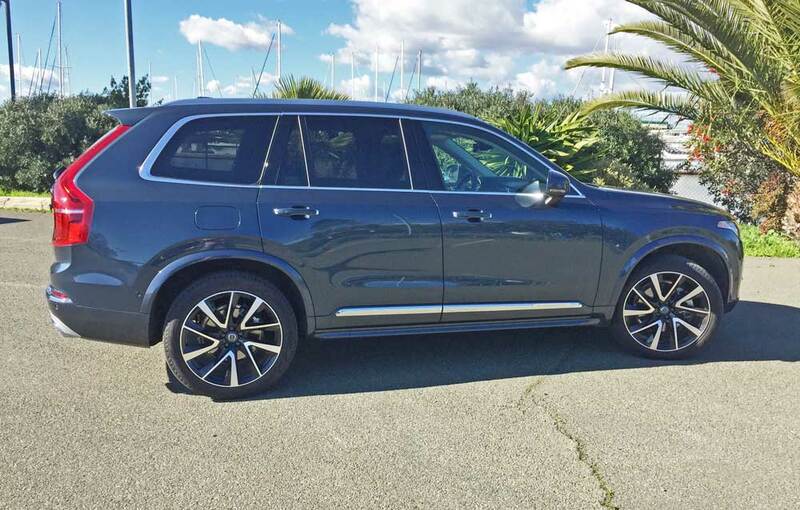 All trim levels of the XC90 T6 are AWD only. There are no major powertrain updates for 2019, but the XC90 has some new standard features and updated option packages. Every model now comes with updated infotainment software and third-row seating. A new Advanced package includes self-parking assist, head-up display, and a 360-degree camera system. The new Multimedia package adds navigation, the Harman/Kardon stereo, and a 12.3-inch digital gauge cluster. Volvo also revised the list of single options as well as enhancing the interior and exterior color choices. The exterior design face history, reflects the direction of the company’s future design direction, infused with a host of technological advancements and incorporating Volvo’s Scalable Product Architecture (SPA) technology. 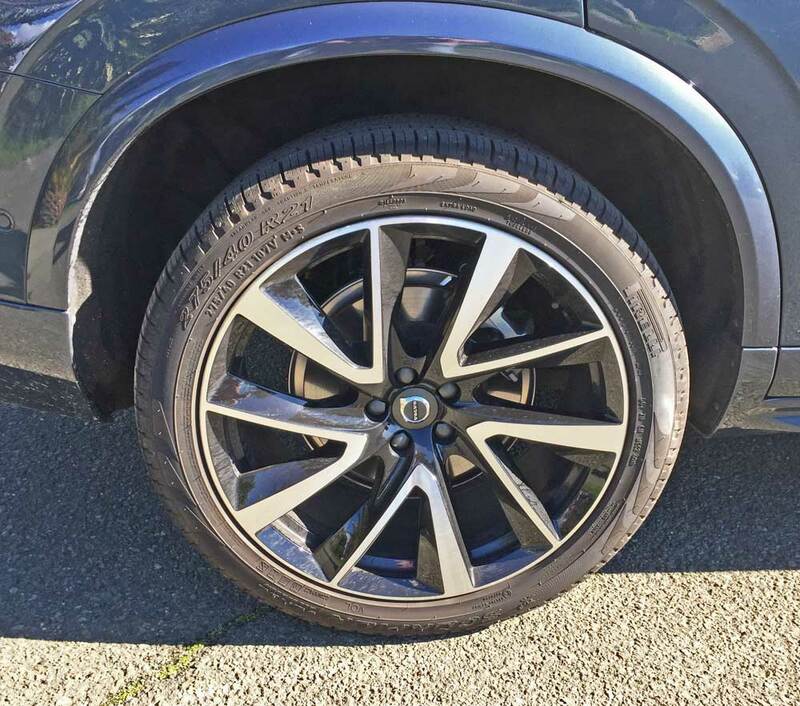 The Volvo XC90 was the first vehicle to feature the company’s more prominent “iron mark”, with an arrow aligned with the diagonal slash that appears across the grille. 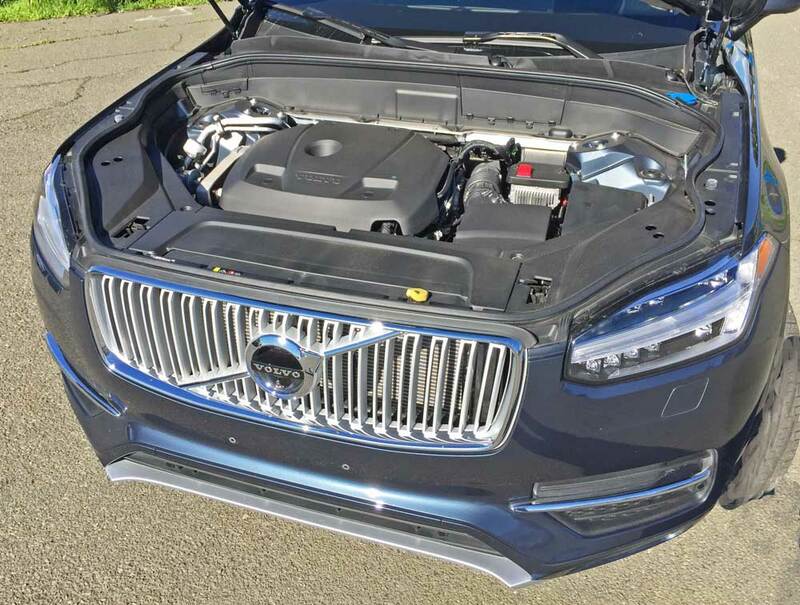 This coupled with the T-shaped “Thor’s Hammer” LED daytime running lights signals the direction of future generation Volvos. 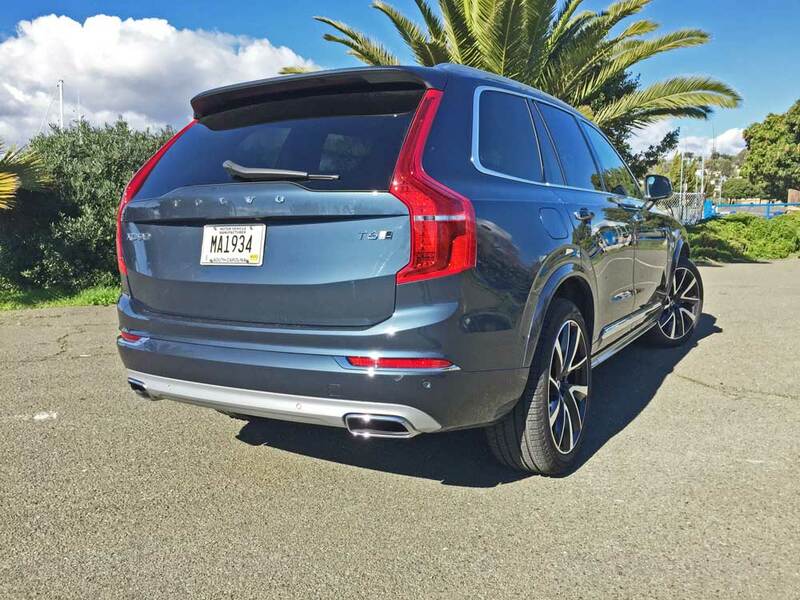 The XC90 also displays a large, elegantly sculpted hood along with a prominent beltline and pronounced shoulders that connect to the rear light design and wider rear stance. The interior is both elegant and lavish, featuring a tablet-like touch screen control console serving as the nerve center of the in-car control system called SENSUS, which is virtually button-free, resembling an iPad, enhancing the cabin’s ambience. The digital craftsmanship and layout may best be described as a stack of flexible ‘tiles’, each displaying a key functionality. Information, navigation and media are high up and easy to check, while phone controls, application icons and climate controls are positioned low, easy to reach and touch. The Crystal gearshift knob adds a touch of elegance along with the handcrafted details and rich materials including Nappa leather and wood trim elements. Controls have been modified with a diamond-cut pattern for a more organic and tactile feel. 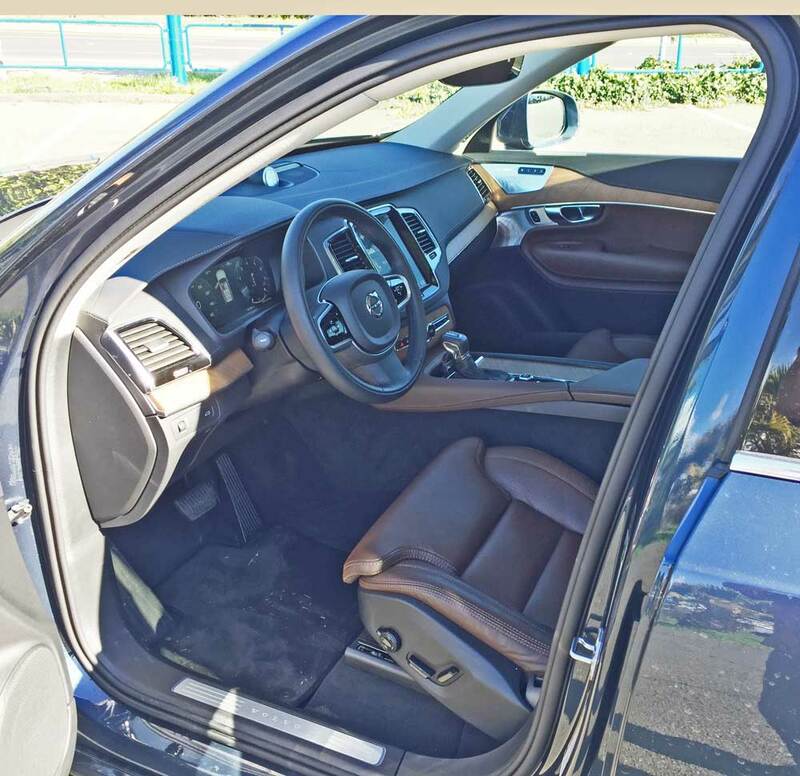 The new XC90 enhances Volvo’s reputation for superior seating comfort by offering innovatively designed seats that also happen to free up interior space for passengers both in the second and third seat rows, helping to make the new XC90 a genuine 7-seater. 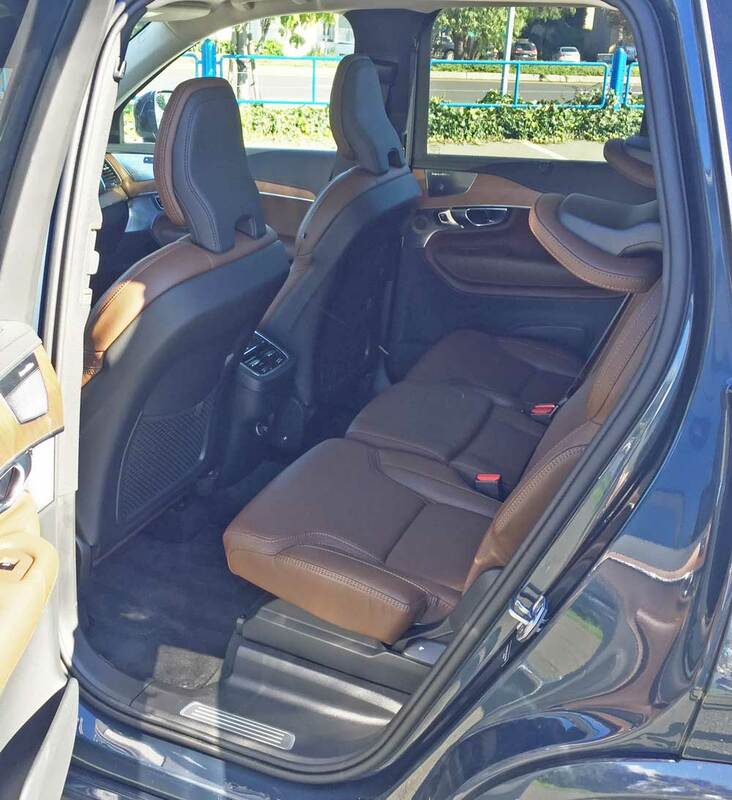 The new seats are available with adjustable side bolsters, seat cushion extension and massage, as well as heating and cooling capabilities. The second row features three individual seats (40/20/40) with a recline adjustment. Also, a sliding function may be used to create more legroom for passengers in the third row – or to increase loading space. An integrated child booster cushion in the center seat is optional. Third row seats are centered for an offset visual path around second row headrests and complete the theatre staging. 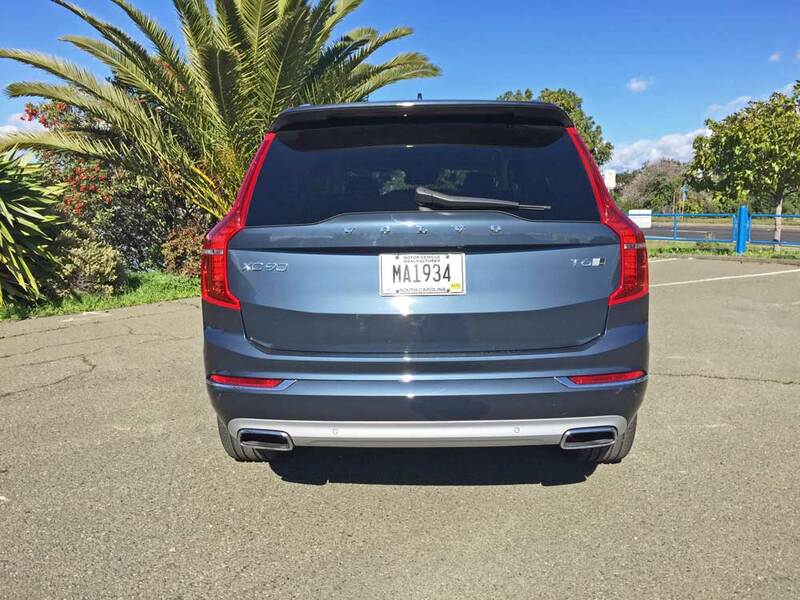 My test 2019 Volvo XC90 T6 was an AWD model in Inscription trim. The exterior wore a Denim Blue metallic finish, while the interior was done in rich brown and Charcoal tones, with linear natural walnut inlay accent trim elements. The base price was $55,700,. With the optional features and destination charge elevating the final tally to $70,540. The 2019 Volvo XC90 T6 AWD Inscription is a high performance luxury SUV, showcasing features that rank it as “King of the Hill” in terms of safety and security. Also included are two significant safety technologies: a run-off road protection package and auto brake at intersection capability. Driving dynamics serve up the smooth, solid ride of a premium SUV, but with a blend of sharp handling and response. The chassis features a double wishbone front suspension and an integral link rear axle with a composite transverse leaf spring. 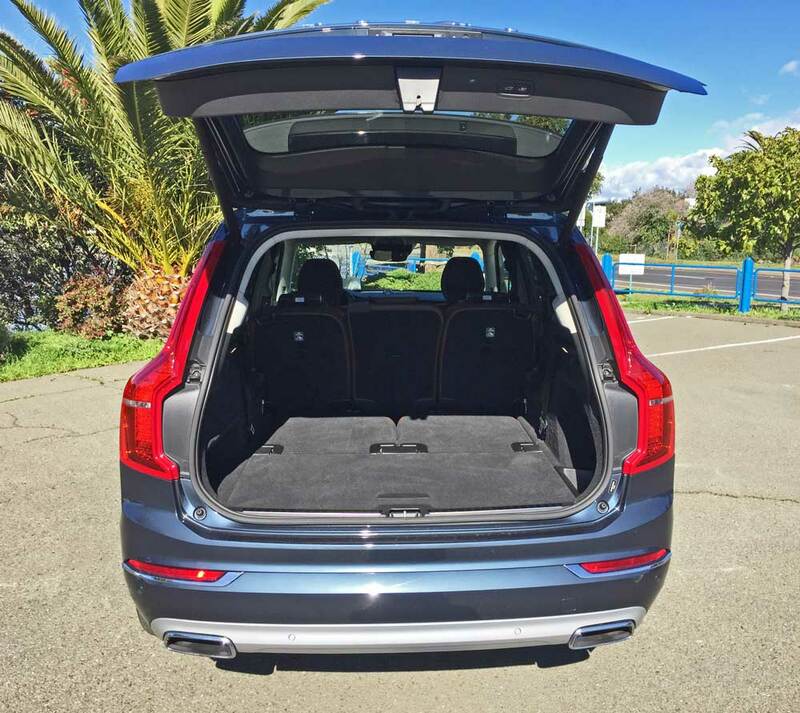 The XC90 may also be equipped with an electronically controlled air suspension that provides a choice of modes: Eco; Comfort; Dynamic; and Off-Road. 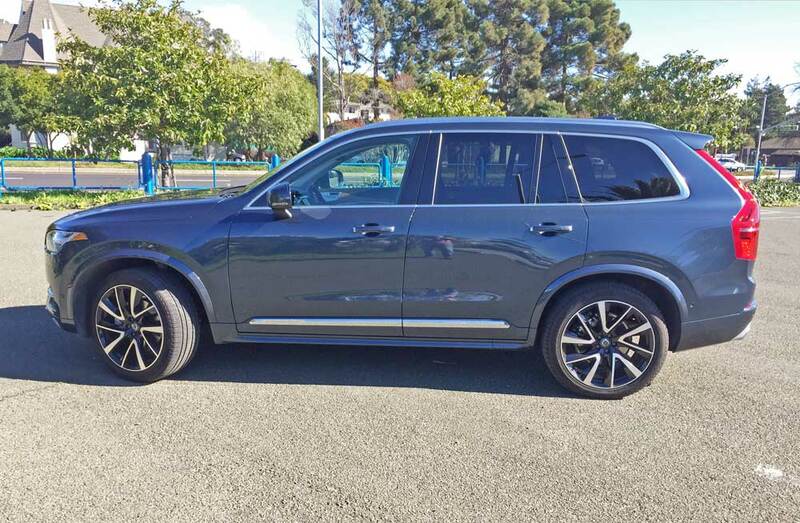 This Volvo XC90 series is one of the most visually appealing Volvo SUVs produced to date. It is also the most comfortable and the best handling, driving more like a luxury sedan, but with sporty attributes. The cabin ambience is not only luxurious, it is highly functional as well. Flexible seating configurations provide a high level of versatility, and the laminated Panoramic Moonroof with power sunshade provides a spacious, open-air feeling. The Eco, Comfort and Dynamic (make that Sport) modes provide a choice of driving applications to appropriately fit specific scenarios, and the controls may be changed on-the-fly. 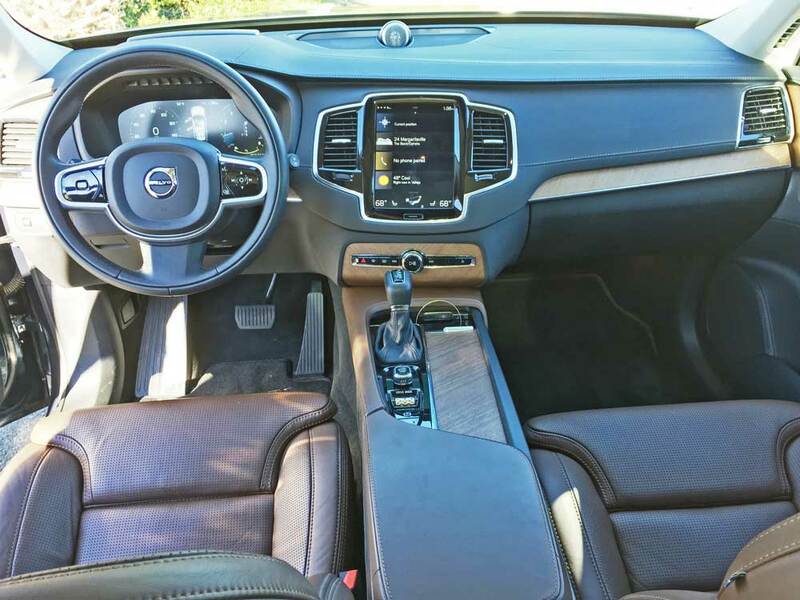 Bottom line, The 2019 Volvo XC90 T6 AWD Inscription is a winning SUV, and it’s sure to compete admirably and highly successfully in a very competitive field. It is truly a Scandanavian Sanctuary that represents a huge advancement in status and capability over the very first 1927 PV4 4-door sedan Volvo model . Engine Type and Size: 2.0-liter, DOHC, 16-valve, supercharged & turbocharged, inline 4-cylinder with gasoline direct injection. Transmission: Eight-speed Geartronic automatic with driver adaptive shift logic and auto stop/start. Drive Train: Transversely mounted front engine / Electronically-controlled AWD with Instant Traction. Suspension: Front – MacPherson strut, with asymmetrically-mounted coil springs, hydraulic shock absorbers, stabilizer bar. Rear – Multilink independent suspension with coil springs, hydraulic shock absorbers, stabilizer bar, cast aluminum subframe. Brakes: 4-channel Anti-lock Braking System with Hydraulic Brake Assist, Optimized Hydraulic Brakes, Ready Alert Brakes, and Fading Brake Support. Tires: Pirelli Scorpion Verde 275/40 R21 mounted on 5-“V”-spoke machine face alloy wheels with painted inners. 0 – 60 mph: 7.1 seconds – Top Speed=132 mph – electronically limited.